(Host) Governor Peter Shumlin says too many students are graduating from high school without the math skills needed to land good jobs. So he and Education Commissioner Armando Vilaseca want to mandate that students take algebra and geometry before they graduate. (Dillon) To underscore the point that students need a better understanding of math, Governor Shumlin invited an executive from IBM Vermont to his weekly news conference. Janet Doyle is the company’s site operations and government programs director. (Doyle) "We do have jobs at IBM today that we are having difficulty filling because of the skill gap, the math skill gap, in the state of Vermont." (Dillon) Only 47 percent of Vermont high schools require students to take algebra; geometry is required in just 31 percent. Most schools require three years of math, but don’t specify geometry or algebra. Governor Shumlin wants to change that. (Shumlin) "What we are presenting today is a proposal to the state Board of Education that Vermont schools require algebra 1 for all ninth graders, mandatory geometry for all 10th graders and algebra 2 by 2017." (Dillon) Shumlin said he supports local control, but also feels strongly that the state needs to raise the bar on math education. He said he was motivated by recent test results that showed just 36 percent of Vermont eleventh-graders were proficient in math. 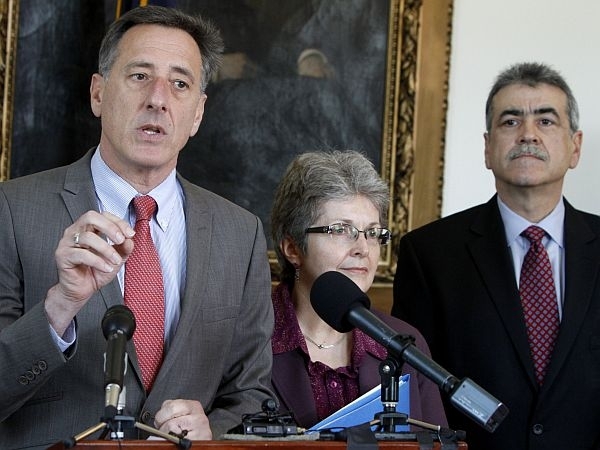 Shumlin said he’s also heard a consistent message from business executives around the state. (Shumlin) "Employers turn to me and say, ‘Governor, you know, you’re spending a lot of money … per student in Vermont, but all I can tell you is we’ve got to retrain them in math, or train them in math – give them basic math that they don’t have when we hire them.’"
(Dillon) The new requirements have to be approved by the state board of education. Board chairwoman Fayneese Miller said the idea is consistent with other education improvements the board has supported. Michael Hock is Director of Educational Assessment. Pam Cyr is a 5th grade math teacher at Shelburne Community School. John Pandolfo is a math teacher at Spaulding High School in Barre. They spoke with VPR’s Jane Lindholm about math scores and curricula in use across Vermont.